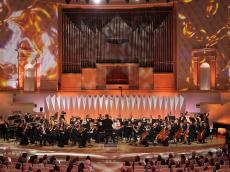 A solemn opening ceremony of the Nutcracker International Television Young Musicians Contest was held at Moscow Philharmonic Society on December 4. The Moscow Academic Philharmonic Orchestra performed at the festival's opening ceremony. The orchestra was conducted by Azerbaijan's Honored Artist Eyyub Guliyev, Day.Az reported. The concert featured masterpieces of classical and modern music. The works of by E. Elgar, M. Ravel, P. Tchaikovsky, J. Brams, N. Paganini, A. Piazzola, A. Dinika, M. Tsfasman, A. Kenfield were presented to the public. Outstanding musicians, members of the jury - David Geringas (Germany / Lithuania), Professor of the Madrid Conservatory Zahar Bron, artistic director of the Zurich Opera Theater Roman Patkolo (Slovakia), Professor of the Nuremberg Music Academy Simon Rubino (Italy), soloist of the Russian National Orchestra Maxim Rubtsov (flute / Russia), as well as bright young musicians, winners of prestigious competitions - Ivan Bessonov (piano / first prize at Eurovision Song Contest), Alexandra Dovgan (first prize at the Grand Piano competition), Darya Vinogradova (harp), Veronika Vinogradova (flute), Andrey Ryazantsev (clarinet), Dmitry Pinchuk (saxophone) received a storm of applause. Besides, the new work by the famous Italian composer Marco Marzi "Echo of Naples", specially written on the occasion of the opening of the music contest was presented to the audience for the first time. The music piece was performed by Paloma So and the Moscow Philharmonic Orchestra aroused great interest among the public. Eyyub Guliyev, a conductor of Azerbaijan's State Academic Opera and Ballet Theater and winner of international competitions, performed together with the Moscow Philharmonic Orchestra in the final of the contest. Guliyev graduated from the Baku Music Academy in 2005. In 2005-2008, he studied at the Saint Petersburg State Conservatoire and the University of Music and Performing Arts in Vienna. Guliyev is the son of People's Artist, tar (stringed musical instrument) player Ramiz Guliyev. He is the winner of several competitions, including the International Conducting Competition after B. Lyutoslavckiy in Belostok in 2006 and the International Conducting Competition after D. Mitropoulos in Athens in 2008. In 2010, Guliyev won the top award, the Giuseppe Sinopoli prize, at the International Conducting Competition named after Arturo Toscanini in Parma. The Nutcracker, International Television Contest for Young Musicians is an annual music competition, organized by "Russia K" (Rossia-Kultura) state TV channel, branch of the VGTRK. Established in 2000 the contest became a recognized and significant event in the Russian music world. Multimillion audience follows with interest the competition of the participants day after day, and "Russia K" TV channel transmits the Gala Closing concert live. Each year the "Nutcracker" contest unravels new and exciting talents from all over the world and provides young performers with opportunity to showcase their skills on a professional level, as well as exchange experiential knowledge and receive the judgment of eminent professionals. The contestants perform in front of many millions of viewers, as the auditions are both televised and streamed live on the channel’s website. Besides, finalists are honored to perform at one of the most prestigious Moscow venues – the Tchaikovsky Concert Hall – with a symphony orchestra accompaniment. In 2016, the International Television Contest for Young Musicians 'The Nutcracker' became a member of the European Union of Music Competitions for Youth (EMCY). The 19th Nutcracker International Television Young Musicians Contest will run until December 11.